If one of the races I have done describes all facets of Adventure Racing, this is it! Our team experienced the lowest low and the highest high in 24 hours. Nothing of this race could be described as easy and nothing was predictable, which made the race an interesting challenge. The 1 day Odyssey Adventure Race started on Saturday, July 23rd at 12pm and went until Sunday 12pm. It was about 96 degrees at the start time, no question that the heat was a determining factor how well teams will do. 41 teams signed up for the race taking the challenge to survive heat, 100mi racing, and an elevation change of 25,000 feet. After we got the maps at 8:30am on Saturday, we planned our race. The race looked like the following: 2 miles running prologue, 40 miles mountain biking, 27 mi trekking, 15 mi paddling, 19 mi biking, orienteering. The numbers are estimated because as I will describe later, we never made it to the paddling section! The race director gave us a cut-off time for the first mountain bike part. We had to be done with the first section at 2am; that meant 14 hours to bike 40 miles. We thought that was plenty of time to bike 40 miles. But we learnt soon enough that a lot of team struggled with that cut off. Our team started with the prologue running the 2 miles and we finished as one of the first teams. 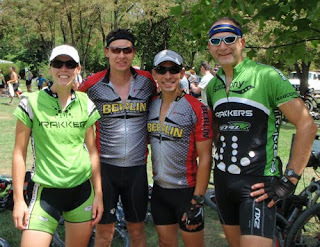 We put our biking gear on and started our 40 mile bike leg around 12:30pm on Saturday. We estimated to be done in around six hours. As it turned out, it took us ten solid hours to complete 40 miles of biking. The mountain bike section started with a half an hour steep climb up a mountain followed by a two hours not-so-steep uphill part. If I recall correctly, basically we climbed the entire time, I do not really remember downhill…maybe because they lasted only 30 seconds while the climbing part took us forever. We made a very good time in the first three hours and were third or fourth place that time. Unfortunately, the heat cooked us and one of my teammates started cramping (quadriceps)…so badly that he couldn’t even do a pedal stroke anymore. That meant walking for him. Despite massage efforts and rest times, his leg did not cooperate. However, he kept a cool attitude and we kept on moving…though slow. Realizing that we were losing a lot of time, we doubted we could finish the race. We felt the heat and our slow progress challenged our high spirits. The terrain was rough…jeep trails with very rocky parts that made it impossible to tow someone. Our goal was to finish the mountain bike part before dark. That didn’t happen. We made it to a check point that was located at a lookout. We reached the lookout right at sunset so we had a great view when the sun went down. However, that also meant that we had to keep going in the dark. After two hours riding in the dark we finally made it to the transition area…at 10pm after 10 hours ride and hike-a-bike. Ahead of us were 20 miles of trekking. At the transition area, we changed into our trekking gear and got water from a creek. We all ate good portions of our food. I realized that I had too little food with me so I had to plan carefully how much I ate the next hours. We still had 14 hours left to race. We left in high spirits and were able to set a fast pace the first five miles. I was celebrating that we got one fourth of the trekking section done when our navigator recounted the miles on the map realizing that it was actually 27 miles instead of 20. This would take longer than we thought. Moreover, our pace slowed down because the paths were overgrown and we had to bushwhack. The next checkpoint was six miles away. With an average speed of 2-3 mi/hr we would take at least 2-3 hours. I think it actually took us 4 or 5 hours because the navigation was tricky to get there. We did not see any team until we actually got close to the next check point. We were wondering what other teams were doing because it became obvious that the race course was way too long for 24 hours. We knew that we were in the front somewhere so we were wondering if other teams even made the 2am cutoff for the first bike section. Having finally arrived at the checkpoint, our goal was to get to the next manned checkpoint as quick as possible so we can get out of the woods at 12pm. We knew we will never finish the trek section or any part after that. It was about 5am when we were heading about 2 miles to the next checkpoint which took us again longer than expected. The following checkpoint was not easy as well and the sun came up. At about 7am we arrived at the last checkpoint before we saw volunteers who could transport us out of the woods. It took us another hour or so to find finally the volunteers in a driveway. I was anticipating a van transporting us to the finish line and real food waiting for us. However, the volunteers told us that the van will drive us to our bikes which we have to take for 19miles to the finish line. Ok, not really what I expected. We barely slept during the night. I fell asleep for two or three minutes when navigational choices were discussed but that was it. One of the volunteers drove us to our bikes where we saw another team leaving the transition area. Being exhausted we did not try to speed up to catch them. We took our time to mentally prepare for another 19 miles. We left around 9:15am and had 2:45h to make 19 miles. No problem, one would think. Not if the first miles was basically bushwhacking through brushes….with bikes. This killed my mood. However, after that arduous mile we could ride on a paved road. But it was 10:30am and we still had 14miles to go. We sped up and made good time. At the last mile, we suddenly saw the team which left the transition area when we arrived two hours ago. Both of us sped up the pace and raced to the finish line. After 23.5 hours racing basically a time trial pace was quite a challenge. We arrived about five seconds before the other team and thought we won. What we completely forgot was that we could get points in the orienteering section because we still had 20 minutes left until the race would be done. So, we quickly plotted the points and left to do the orienteering. The other team seemed to do the same. After we found the first checkpoint we called it a race and headed back and we found the other team hanging out at the finish line never having left to orienteer. That meant we got more points than them. Since no other team has arrived at the finish (out of 41 teams) we waited until 12pm with the hope no other team would arrive because that would mean we would win. At 12pm, sure of our victory we went to get food when another team pulled in. They were originally ahead of us during the trek part and apparently received time credit for being ahead of us, which we didn’t know. So they were declared as winners. After 40 minutes the team, which was ahead of everyone arrived. Despite their time credit they came in late and were disqualified. We ended up being second place which is incredible considering what we went through. 12 hours before, we were considering pulling out of the race and now we got second. We were told that more than half of the field gave up in the first 12 hours and even more pulled out as time went on. I don’t know what happened to those who are still walking in the woods trying to find a manned checkpoint. It was a tough race, mentally as well as physically but that is what adventure racing is about, you never know where you are until you finish.